After spending a full day of searching EVERYWHERE, Jeff and I have figured out the cheapest way to create our rooftop deck garden! 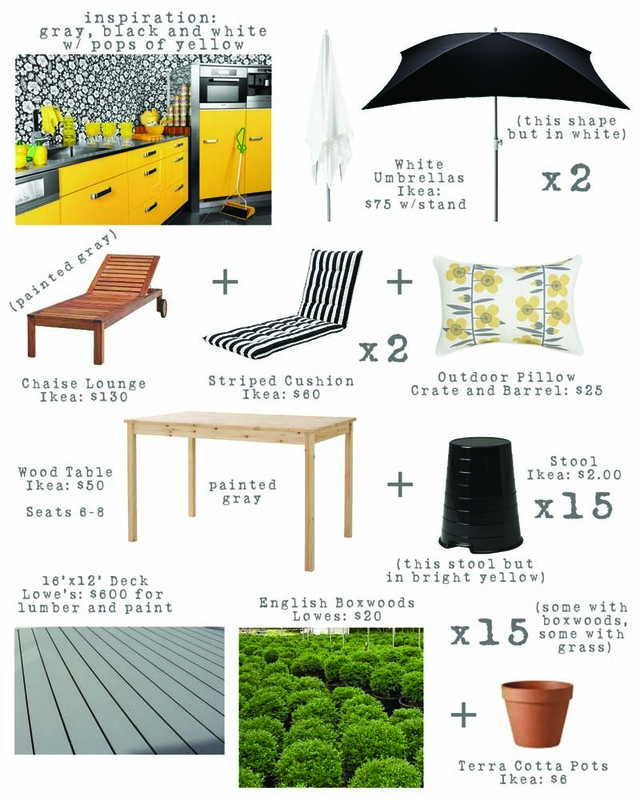 I was hoping to keep everything at $1000 with the decking, plants and furniture, but that was overly idealistic. We aren’t too far off, but it will be closer to $1700, and we might be able to save a little here and there as we get going. We wanted to maximize the entertaining area/seating and minimize on plant care, so we settled on boxwoods that are those bushes you can prune into shapes or animals…maybe one day we will have 10 little giraffe topiaries. We will supplement the boxwoods with pots of tall grasses or maybe (to save money), just some lawn grass. Perhaps with pink flamingos stuck in them? Our only concern are the Ikea stools that sort of look like trash cans upside down. We are hoping that with a lot of them, some used as plant stands and some as seating at the table, they will seem more like a statement than an accident. We start building next weekend, so cross your fingers and we will keep you posted on the progress! I totally lost track of the the time–can I help? Do you need anything drawn? Illustrated? Drop a line! just a note from experience: Ikea Wooden Things do NOT last long outdoors. I could show you pictures. we figured that ikea stuff wouldn’t last long outside, which is why we are going to paint it all with a good outdoor paint to seal it in. If that doesn’t work, we will save up to buy good patio furniture! Love the color scheme! Very Palm Springs modern. Check out the Viceroy Palm Springs website to see more black/white/yellow. Can’t wait to see the finished product! I love your scheme but I don’t know if the boxwood is a good idea. It may scorch in the reflected heat and rooftops also tend to be much windier than gardens at ground-level — they are their own microclimate. Have you thought about pittosporum instead? It’s much more heat-tolerant and also doesn’t mind wind. Do you have a tap or a way of getting a hose up to the roof? In hot weather you will have to water a lot — maybe every day. Bigger pots are better because they don’t dry out so quickly. Also, I hate to say it but terracotta is not necessarily your best choice for pots for a roof garden: it’s heavy and allows the soil inside to dry out really quickly. Generally our lookalike-ish plastic pots kept plants happier. I gardened on a big roof terrace in Rome for a couple of years and also suggest you make sure the umbrella has a really heavy base — and use a bungee cord or similar to keep it from blowing open if you get a summer storm. The wind can create a surprising amount of lift! I second the comment about wooden Ikea furniture outside, btw. In the end we just had to toss our loveseat. The book “Gardens in the Sky” was helpful to me for thinking through some of these problems. Feel free to email me if you want to brainstorm plants or anything — I am really loving your blog, btw! I think the idea to paint the Ikea table is amazing. What an inexpensive way to customize it to your personalities and design scheme. And the $$$ you’ll save. I think I’ve just decided to totally rethink the plan I had for MY back yard. How will you weather proof the table?! I think we are going to start by painting the table, chaise lounges and deck with BEHR PREMIUM 2-IN-1 WOOD PREP NO. 63 and then use BEHR PREMIUM PLUS ULTRA EXTERIOR SATIN or SEMI-GLOSS ENAMEL. I’ve read a lot about this paint, and it seems to be the best way to protect the wood from the elements, AND it comes with a lifetime guarantee…so you can’t really beat that!